Built in 2003, the Murano Grande is a high-end condominium tower in the heart of South of Fifth. With Sieger-Suarez as the architect and the Related Group of Florida as the developer, this unique "SoFi" condo boasts an unbelievable lifestyle complemented by fantastic in-house amenities. Standing over 400 feet high, the Murano Grande offers breathtaking views of Biscayne Bay and South Beach and is well-known as one of the most stylish buildings in Miami Beach. With units ranging from 1300 to over 4000 square feet, the Murano Grande features cutting-edge designs and dramatic architectural styles for the most distinguished tastes. Residents enjoy living in the height of luxury amid soaring ceilings, floor-to-ceiling windows, top-of-the-line gourmet kitchens, and spacious layouts. Murano Grande amenities include an Olympic-sized swimming pool, glamorous pool deck with magnificent views of Biscayne Bay, expertly designed lighted tennis court, newly renovated fitness center and 24-hour concierge service. Fall in love with the sumptuous lifestyle of the Murano Grande in South of Fifth. Located at 400 Alton Road, the Murano Grande is just steps away from gourmet dining, upscale shopping, and fantastic recreational opportunities of South Beach and South of Fifth. Thinking About Selling Your Murano Grande Condo? Selling a condo in Murano Grande? I can help. Learn more about listing your home with me, Jose Laya, including the tools and resources I offer my sellers, my marketing strategies, and my personal dedication to each client. South of Fifth is not only known for its magnificent and peaceful location but it is also home to world-famous restaurants, top-notch beaches, and gorgeous parks. One of Miami Beach's most famous and visited restaurants, Joe's Stone Crab is found in South of Fifth along with Smith & Wollensky which is at South Pointe Park. Here one can sit and enjoy a great meal and watch the cruise ships go by which is an experience very rarely found in one of Miami Beaches truly breathtaking locations. South of Fifth is also home to some of Miami Beach's most luxurious and exclusive condos including Apogee South Beach, Continuum North and South Towers, Glass, One Ocean, Portofino Tower, Apogee South Beach, Icon South Beach, Murano Grande, Murano at Portofino, Ocean House, 321 Ocean. There's a reason South of Fifth is one of Miami Beach's most popular destinations. From its glamorous beaches to its premier dining scene, South of Fifth offers nothing short of a world-class lifestyle. Living at Murano Grande grants residents with convenient access to all this area has to offer. Take advantage of all that "South of Fifth" has to offer by living in the highly sought-after community of Murano Grande. As one of the most popular condo towers in South Beach, the Murano Grande is impeccably located; it's just behind the Miami Beach Marina and a short distance away from Downtown Miami, Brickell Avenue and the American Airlines Arena. Surrounded by water on three sides, from the Atlantic Ocean on the East to the Biscayne Bay on the West, the Murano Grande offers breathtaking views from practically every angle. Take a peek at some of my favorite features below, and don't hesitate to contact me if you have any questions about life in Murano Grande. 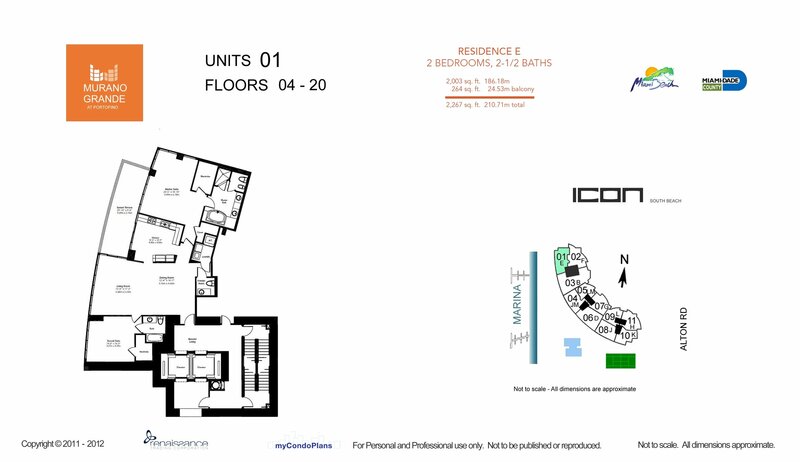 Looking for your perfect condo in Miami Beach? I can help. As a Miami Beach luxury condo expert, I have in-depth local market knowledge and extensive experience in the Miami Beach area. Allow me to leverage my unique expertise to help you find your dream home today.